Every holiday season about 4 million (!) tons of gift wrap and decorations end up in our landfills. That’s just in the U.S.! Imagine worldwide… With the holiday season at our doorstep, it’s a good time to take a moment to come up with a strategy for avoiding or limiting excess waste and for considering our environment during this festive time of year. The Japanese are the pioneers in sustainable gift wrapping with a long history of Furoshiki Wrapping Cloths. We can lean on their tradition and knowledge, and use this same method of wrapping with our Nuscheli cloths. A Nuscheli is a simple, beautiful and eco-friendly way to wrap objects for gifts. And best of all, they can be re-used over and over again after gifting. A gift wrap that keeps giving! There are several different ways to wrap an object Furoshiki-style. The simplest is placing the Nuscheli on a diagonal in front of you and placing the gift in the center of the Nuscheli. Tie two opposite corners in a knot and then the other opposite pair. To dress up a gift for the holidays, you can simply take a piece of something compostable (twig, lavender, dried flowers etc) and tie a second finishing knot around it. Et voilà! You may have a stack of used Nuscheli, which your baby might have outgrown that you can use as gift wrapping, or you can gift wrap with a brand new Nuscheli, especially if you are gifting a new mother! She can use it for her baby after unwrapping. But if the receiver of the gift does not have young children, you can mention that they can wrap gifts themselves with it, or use it as a wash cloth, cleaning rag, or to wrap food with. Give it a try! Your tree will look wonderful with an array of Nuscheli-wrapped gifts! And how great if we can make a targeted effort to lowering the yearly waste from holiday gift wrap and decorations! P.S. Even if the receiver of your Nuscheli-wrapped gift ends up throwing away the Nuscheli by accident, know that it will not add to the landfill, because they will biodegrade (compost) naturally and safely back into our eco-system! You can’t go wrong! Zero-waste guaranteed! In a world where we are actively making an effort to improve the footprint we leave behind (or rather, the lack of footprint) by having chosen to pursue the Cradle 2 Cradle Gold standard for fabricating Nuscheli, it goes without saying that we continue to limit the waste we produce and encourage mindfulness revolving around eco-friendly and sustainable living choices. With that being said, we try to innovate on the daily! Sometimes its as simple as looking around at what you have and making use of these things in a rather unexpected way. For example, using a Nuscheli as a diaper cover! It looks, sort of, home-made, which is part of the sustainable idea. Its an adorable way to dress up a diaper during summer days. We've been experiencing a heatwave in Los Angeles this past week, and the idea came from living in diapers to tolerate the heat. Simply tie a double knot on either side of your baby's hip and voila! 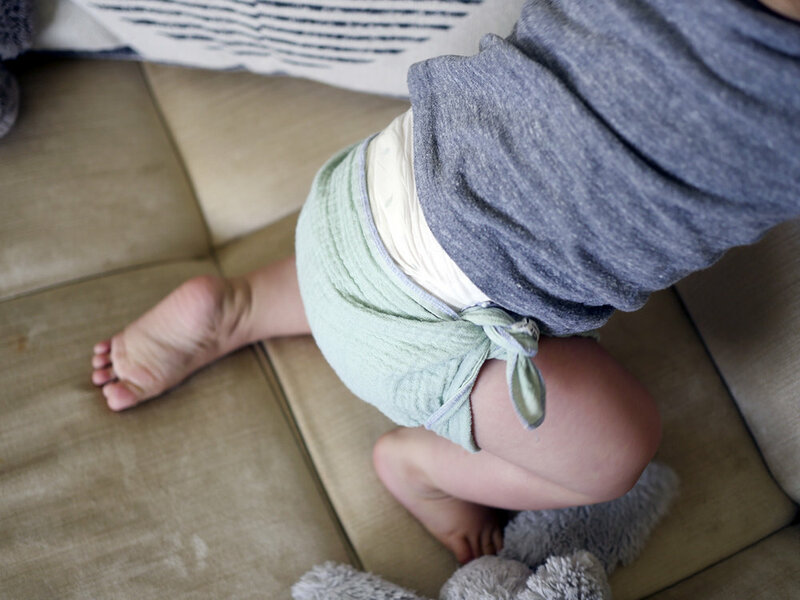 This idea keeps getting better, because since you create this wearable piece from a square cloth, its adjustable at the ties to fit babies from infant to toddler. It can grow with your baby and has a longer lifespan as diaper cover! Anyone following a minimalist wardrobe lifestyle will especially appreciate this simple multi-use of our Nuscheli! Like always - they store easily, weigh next to nothing and function in so many different useful ways for you and your baby! This post might not be our most enjoyable one (photo-wise) yet, because we are showing a baby with a runny, snotty nose. However, the photos get the point across and highlight another good use for our Nuscheli with children. Worn as a scarf, Nuscheli become an ideal cloth for wiping your child's runny nose (over and over) and keeping a little control over the snotty mess that will quickly spread onto clothes, furniture and you otherwise. Most importantly, because they are made with 100% organic fair-trade cotton and without any chemicals or irritants, they are softer than regular fabric handkerchiefs and don't make your babies skin raw. This post was inspired by one of our customers. She wrote us to tell us that her toddler daughter used the Nuscheli scarf by herself as an on-demand rag to wipe her own runny nose over and over! A snot rag! She didn't assume this use when she bought the Nuscheli, but was so delighted that she didnt even have to manage her toddlers snot mess. Her daughter's clothes stayed clean and she would just replace the Nuscheli with a fresh one every other hour. The key is that having a solution handy for busy toddlers which looks good and helps too, is amazing! We've gotten many, many requests from women about whether our Nuscheli fit adults, too. And the answer is yes! Bandana scarves (Nuscheli) are for adults, too! We've mostly been talking about Nuscheli uses for babies and toddlers, so far (since they are so practical during those years). But they are a great accessory to add to your wardrobe as well. They are easy to store and easy to care for. Considering our environment and our approach of zero waste in the production and the end use of our Nuscheli, this use highlights perfectly how Nuscheli can live on beyond the baby and toddler years. Older children and adults can inherit these practical cloths after they've been used for burping, as bibs and scarves on your baby. Or grab a new pack for yourself, or as a gift for a female in your life!